To those of you who received our unfinished post, we apologize. The mouse and “publish” button have a relationship that is sometimes out of our hands. There is so much I could say about Husk, and every statement would end with an exclamation point. Actually, that’s really the only way we can convey our excitement- so exclamation points it is. Get ready for an exciting ride down flavor lane! Dining at this Charleston gem is a true treat for any palate! One of the hardest parts of writing this post is being forced to look at the menu, and not be able to enjoy it! I have to settle for a hazy memory of that dining experience, flavor after flavor delighting the appetite and indulging the senses! We were lucky enough to get reservations for Friday night during Charleston Restaurant Week, and WOW were we excited! 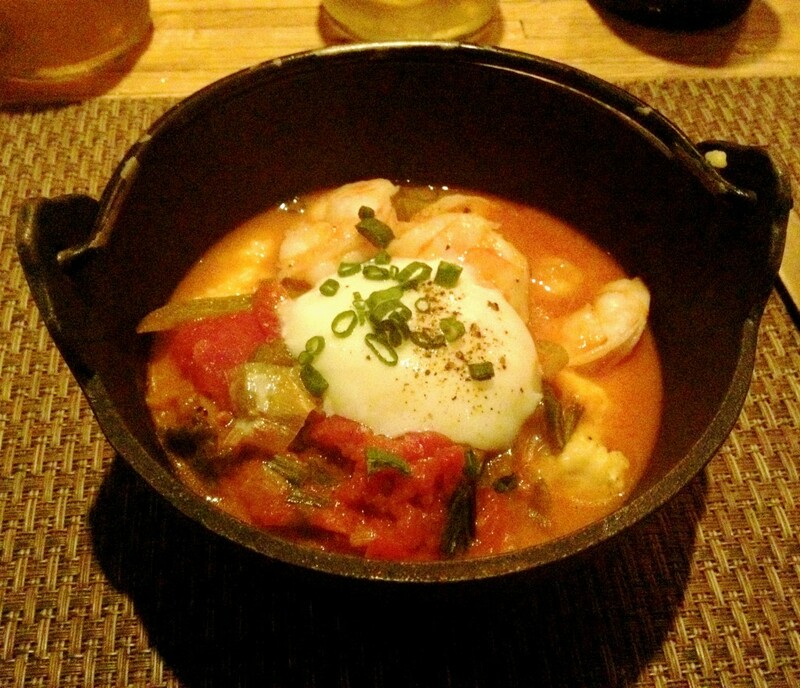 Florida Shrimp and Grits with Tomato Braised Peppers and Onions, Charred Scallions, Soft Poached Farm Egg! Served up southern style in a mini cask iron cauldron! Almost like the cauldron’s contents were taken right out of the Florida marsh! Fresh Florida Shrimp, swimming in a shallow bath of briny broth! Grits make up the the sand-like bottom of this tasty tidal pool! A very appropriate introduction to our dinner! 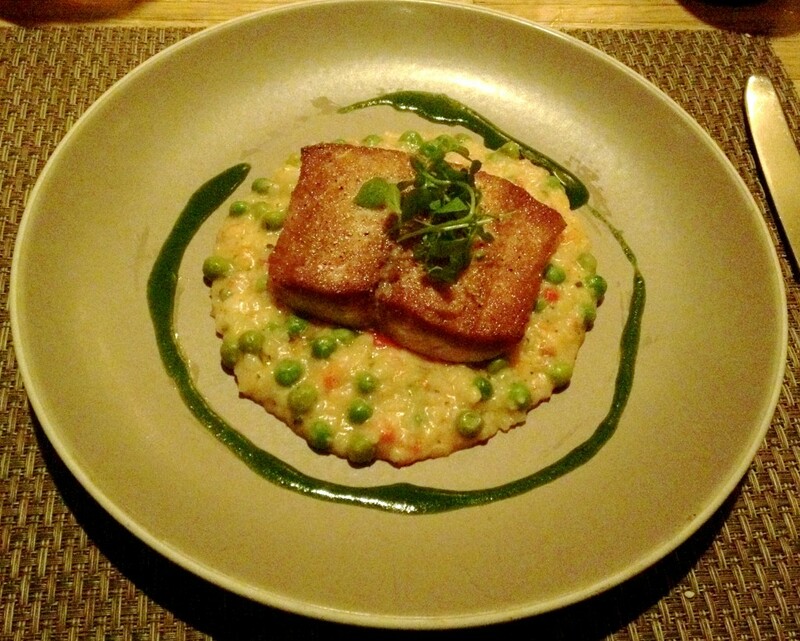 Mark’s Rudderfish, Carolina Gold Rice “Risotto”, Smoked Tomatoes and Sweet Peas, Red Peppers, Arugula Pistou! The rudderfish (what is a rudderfish?) makes a rare appearance on the menu and the tempting description sells it to my fellow Capital City Eater! The presentation nearly matches the wonderful flavors of the dish! 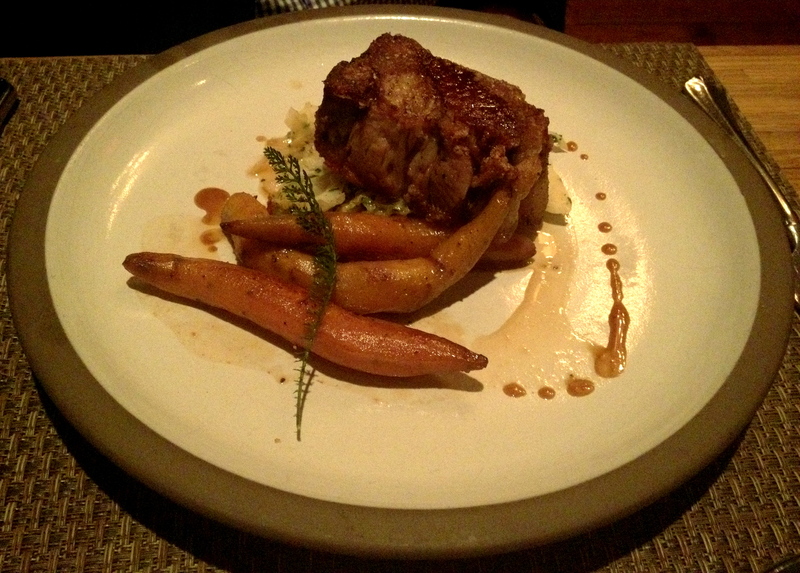 Heritage Pork from Adam Musick, Cider Braised Cabbage, Baby Sweet Potatoes, Bourbon Demi-Glace! Under that tender hunk of heritage pork is a serving of the best cabbage I have ever had the privilege to taste! The sweet potatoes compliment the pork nicely, although they appear slightly awkward in presentation! The atmosphere was tasteful! The service was impeccable! Glasses of water were refilled with only slightest notice of the waiter! Allow me to take this opportunity to advise waiters on a pet peeve of mine! Always refill the water glass! If you have to ask, you are already disturbing the experience of the fine people enjoying their meal! Our dining experience was a memorable one, and we will be back as soon as possible! Husk is located on Queen St. in beautiful Charleston, South Carolina! Conveniently located near a parking garage! Recently named Bon Appetit Magazine’s 2011 Best New Restaurant in America, this is one dining experience you do not want to miss!